Today's post will deal with the last two aspects of this issue that I have not yet discussed, as well as providing some additional information about the flat plate and rotary press printings that has been brought to my attention by Julian Goldberg, a philatelist based in Toronto. This information is very interesting and shows that no matter how much you think you know about Canadian philately, there is always something new to learn. 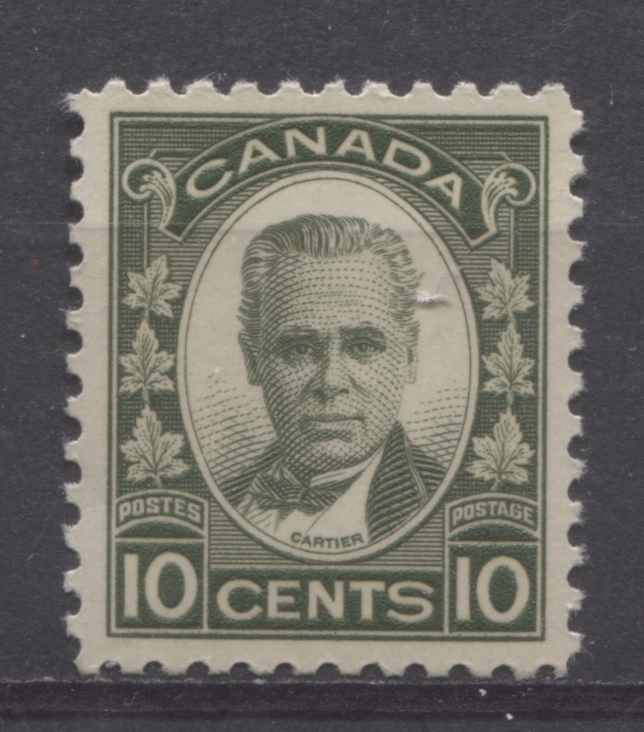 The 10c George-Etienne Cartier stamp, which replaced the 10c Parliamentary Library stamp on September 30, 1931. 64,300,000 stamps were issued between 1931 and 1935. At first, these appear to be largely oddball stamps that offer little to interest the collector. However, as we shall see, both stamps exist with a large number of varieties to interest and challenge the specialist of the series. Before I get into a discussion of these two stamps, I wanted to take a moment to share some information that was brought to my attention by Julian Goldberg. Apparently this information was first discovered and reported on by Charles Neyhart, so credit for it should go to him. I was surprised to learn that the printing process used by the Stickney Rotary presses is a wet printing method in which the printing is done on dampened paper, which shrinks across the grain as it dries and is then gummed after printing. I had thought that all stamps printed after the dry printings of the admirals had made their appearance in 1922-1923 were printed using the dry printing method. Apparently this is not so. The flat plate printings during this period from 1930-1935 are the only ones that were printed on pre-gummed, dry paper. Rotary sheet stamps measure just under 18.50 mm x just over 22.0 mm. So while there is little to no difference in the width of the design on the sheet stamps from one process to the other, the rotary press printings have slightly taller designs than do the flat plate stamps. Rotary press stamps are perf. 11.25 x 11, or 11.25 x 10.94 on an Instanta gauge. Flat plate stamps are perf. 11 x 11, or 10.94 x 10.94 on an Instanta gauge. So the rotary press stamps have a full quarter of a perf. more on the horizontal measurement than the flat plate stamps do. This is exciting because it means that there could be coil waste rarities in existence, just like with the US issues of this period. These would be perforated stamps that measure the same height as the flat plate stamps, when they should be taller. Likewise, it may be possible to find flat plate stamps that have the perforations normally found on the rotary press stamps. So it is very much an area in need of further study, I believe. olive green, cream gum with a satin sheen and no visible mesh. olive green, deep cream gum with a satin sheen and no visible mesh. deep olive, deep yellowish cream gum with a satin sheen and no visible mesh. deep olive, coffee coloured gum with a satin sheen and coarse vertical mesh. deep olive, deep cream gum with a glossy sheen and no visible mesh. bronze green, deep mottled cream gum with a satin sheen and no visible mesh. bronze green, clear deep cream gum with a satin sheen and fine vertical mesh. deep grey olive, deep cream gum with a glossy sheen and no visible mesh. deep grey olive, deep cream gum with a glossy sheen and fine mesh. deep grey olive, coffee gum with a satin sheen and coarse vertical mesh. deep grey olive, cream gum with a satin sheen and no visible mesh. deep grey olive, deep cream gum with a satin sheen and no visible mesh. Three plates were used to print this stamp, and plate blocks are scarce and are all premium items. They are generally collected as blocks of 4. Plate 1 comes in all four corner inscriptions, while plates 2 and 3 exist with only upper right and lower right positions. This stamp is also found in imperforate pairs, which are very scarce, as only 150 were issued. Lastly, first day covers exist for this and are very scarce, cataloguing $900 each. The inexpensive nature of used singles, makes this an ideal and fun stamp to collect for CDS town cancellations. A large black dot, representing a period after the 3. The top right surcharge bar bent down. Shifted surcharges - there are many different, some of which are found either in the centre of the stamp, or at the top of the stamp, instead of at the bottom. 58,265,000 stamps were overprinted, which is a relatively low number for a low value definitive. The die 2 version was released on June 21, 1932, while the earliest known use for the die 1 is November 30, 1932. 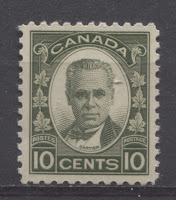 Despite the quantity issued, it is a relatively inexpensive stamp, listing for only a few dollars in mint condition and being very inexpensive in used condition. So again, it makes a nice stamp for the collection of cancels. bright scarlet, die 2, cream gum with a satin sheen, distinct vertical streaks and no visible mesh. scarlet vermilion, die 2, cream gum with a satin sheen, indistinct vertical streaks and no visible mesh. scarlet vermilion, die 2, cream gum with a satin sheen, distinct vertical streaks and no visible mesh. scarlet vermilion, die 2, cream gum with a glossy sheen, indistinct vertical streaks and no visible mesh. bright scarlet vermilion, die 2, cream gum with a satin sheen, indistinct vertical streaks and no visible mesh. scarlet, die 2, cream gum with a satin sheen, indistinct vertical streaks and no visible mesh. scarlet, die 2, white gum with satin sheen, no vertical streaks and no visible mesh. scarlet vermilion, die 1, cream gum with a satin sheen, distinct vertical streaks and no visible mesh. scarlet vermilion, die 1, cream gum with a glossy sheen, indistinct vertical streaks, and no visible mesh. scarlet vermilion, die 1, white gum with a glossy sheen, no vertical streaks and no visible mesh. vermilion, die 1, cream gum with a satin sheen, no vertical streaks and no visible mesh. vermilion, die 1, cream gum with a satin sheen, indistinct vertical streaks and no visible mesh. deep rose red, die 1, cream gum with a satin sheen, distinct vertical streaks and no visible mesh. deep rose red, die 1, cream gum with a satin sheen, indistinct vertical streaks and no visible mesh. Bright scarlet vermilion, die 1, cream gum with a satin sheen, indistinct vertical streaks and no visible mesh. The above list is not exhaustive and merely represents a cross section of the stamps I have seen. There are likely additional shade and gum varieties not on this list. First day covers exist for both die types. Die 2 is relatively inexpensive, listing for $25 in Unitrade, while die 1 is very scarce, listing for $250. This concludes my posts about the Arch Issue. My next posts will deal with the 1932-1934 commemorative issues and the Medallion issue of 1932-1935. Is not the 1 cent of the Medallion issue, Scott# 195d actually a rotary press dry printed stamp? Not to the best of my knowledge. My understanding of the rotary press method of printing is that it utilizes damp paper and all rotary press stamps that I know of, whether they are from Canada or the US, always have gum breaker ridges and streaks on the gum. #195d has completely smooth gum that is characteristic of a flat plate printing.